Birth Willam James Thurley was born on 18 June 1876 in New BrunswickBG. 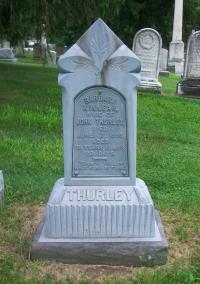 Birth Annie M Thurley was born in 1871 in EnglandBG. Birth Bridget "Bertha" Ann Conboy was born on 6 January 1881 in Ballyhaunis, Mayo, IrelandBG. Death She died in 1935 at age ~54 in New YorkBG. Birth Charles Francis Thurley, Sr., was born on 25 August 1901 in Rhode IslandBG. Death He died on 19 April 1958 at age 56. Birth Ethel Mae Veronica Thurley was born on 1 October 1897 in Providence, RIBG. Marriage John Edward Aloysius Mac Donald and she were married on 21 January 1918 in St. Joseph's Church, Providence, RIBG. Death She died in 1970 at age ~73. Birth George Otis Thurley was born on 14 April 1904 in Rhode IslandBG. Death He died in May 1941 at age 37 in Lincoln Hospital, Bronx, NYBG. Birth Helen Elizabeth Mary Thurley was born on 4 May 1913 in Gano St., Providence, RIBG. Death She died on 26 September 2003 at age 90 in Granbury, Hood, Texas, USABG. Birth John Edmund Thurley was born on 17 November 1908 in Providence, RIBG. Death He died in July 1984 at age 75 in East Providence, Providence, Rhode Island, USABG. Birth Mildred Ann Nora Thurley was born on 28 July 1906 in Rhode IslandBG. Death She died on 6 November 1983 at age 77 in Menlo Park, San Mateo, California, USABG. 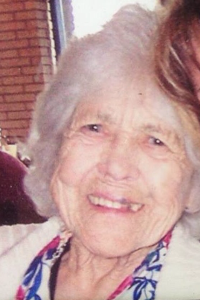 Birth Rita Eileen Thurley was born on 18 September 1917 in East Providence, RIBG. Marriage Kenneth E W Lewis and she were married on 12 August 1939 in Winchester, VA (eloped)BG. Death She died on 5 February 2004 at age 86 in East Providence, Providence, Rhode Island, United States of AmericaBG. Death Wilbur Thurley died in Bronx, NYBG. Birth He was born in 1911 in Rhode IslandBG. Birth William J Thurley was born in 1900. Death He died on 21 March 1904 at age ~4 in Providence, Rhode IslandBG. Birth Kenneth E W Lewis was born on 8 September 1908 in Dunmore, PABG. Marriage He and Rita Eileen Thurley were married on 12 August 1939 in Winchester, VA (eloped)BG. Death He died on 19 July 1998 at age 89 in East Providence, Providence, Rhode Island, United States of AmerBG. Birth John Edward Aloysius Mac Donald was born on 12 December 1894 in Providence, Rhode IslandBG. 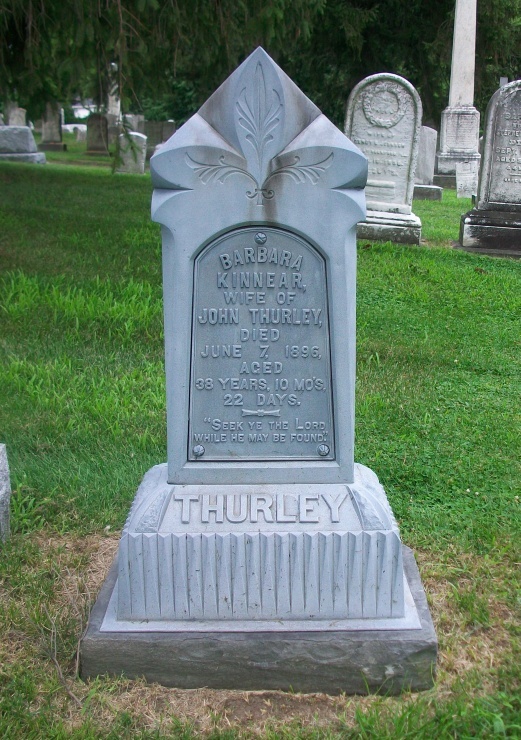 Marriage He and Ethel Mae Veronica Thurley were married on 21 January 1918 in St. Joseph's Church, Providence, RIBG. Death He died in October 1967 at age 72 in Rumford, Providence, Rhode Island, USABG. Birth William J Mac Donald was born on 22 October 1918 in Fox Point, Providence, RIBG. Death He died on 5 May 1990 at age 71 in Rumford, RIBG. Birth John H Sturtz was born on 6 June 1905 in New York City, NYBG. Death He died on 26 July 1972 at age 67 in Santa Clara, Santa Clara, California, USABG. Birth Charles Francis Thurley, Jr., was born on 23 December 1925 in Rhode IslandBG. Death He died on 3 January 2009 at age 83 in Pawtucket, Providence, Rhode IslandBG. Birth Gertrude Christina Yates was born on 21 June 1905 in Rhode IslandBG. Death She died on 26 May 1998 at age 92 in Lincoln, Providence, Rhode Island, USABG. Birth Gertrude Ethel Thurley was born on 6 April 1927 in Rhode IslandBG. Death She died in 1988 at age ~61.